After yesterday’s adventure with boomerang needles and vanishing yarn, I was ready for a good day today. I went fabric shopping! That’s always good. More on that tomorrow, when I will show you the gorgeous goodies I now own. They followed me home, so I get to keep them now. 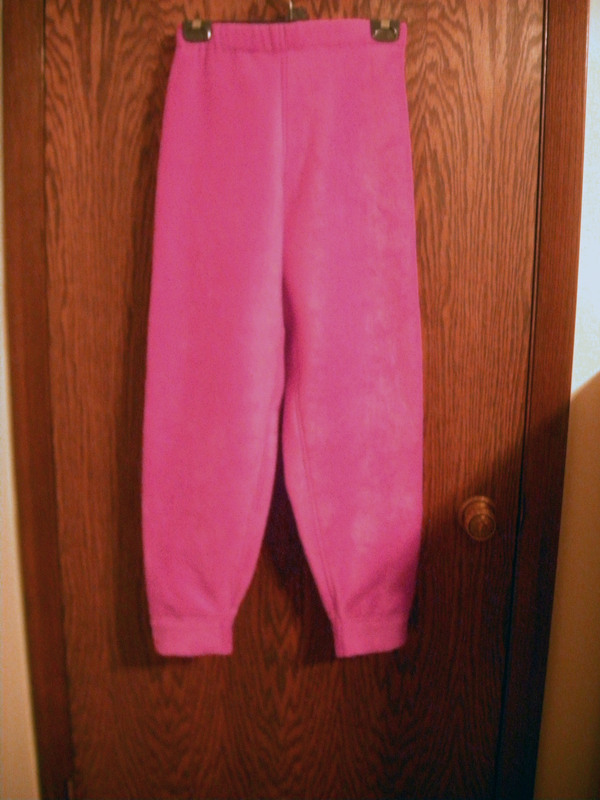 And then I sat down to finish the pink fleece set. 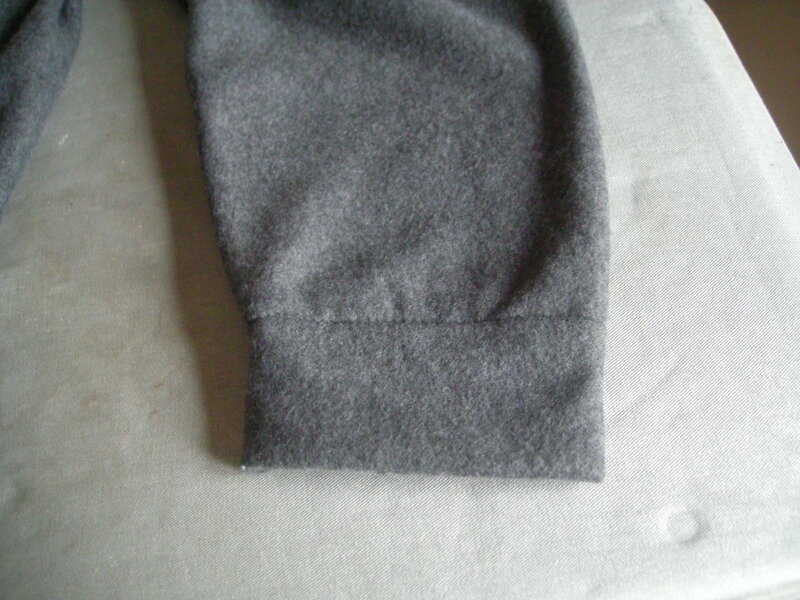 I had only to top stitch one armscye seam and attach the hood. I wound a new bobbin and threaded up the new spool, and made it a whole entire two inches into the topstitching when this happened. NOT COOL, SINGER. NOT COOL. That sucker snapped like a dry twig. Unbelievable. I had to hunt all over my sewing room for the bag of needle packs — seriously, I have an entire ziplock sandwich bag stuffed full of the little packs of Schmetz needles, my favorite kind. But for some reason, I can never find them when I need them, and I’m starting to think gremlins are moving them when I’m not looking. I have two plastic storage bins for notions. Two. So there are only ever two places for me to look for needles, and I can still never find them. I think my bins are packed too tight and I can just never find what I need in them anymore. Hmm, that might be something to fix while I’m on make-cation. Anyway. Finally found the needle, and in the process of the hunt, began to question whether the sewing gods are mocking me. I never have problems like this. 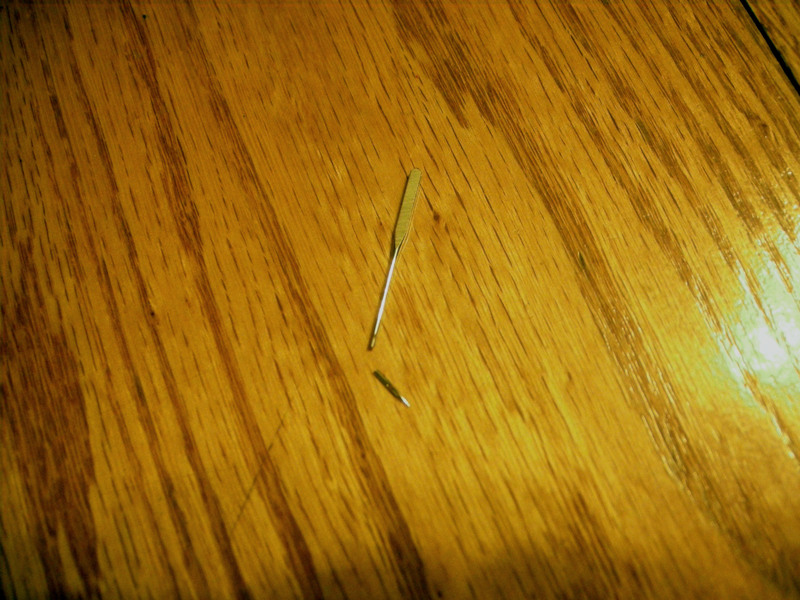 Two needles destroyed in two days? Never happens to me. Well, I guess I can’t say never anymore. In any case, I almost called it a day and went to find my knitting instead, but then my stubborn Taurus side emerged. I would by god finish that fleece set today. I’m very glad to have these done because I’m ready for a break from sewing fleece. I have one more length I want to sew in the next month, but I won’t do that just yet. Because my house is very cold, It was a good idea to push to make some of these warm things quickly, but I’m really looking forward to sewing anything else. Anything. Just not fleece. Just for a little while. While I was out today, I picked up some bemberg lining, thread, and a zipper to make a wool skirt — the wool is already cut, and now I have the other bits I need to actually make the thing. That will probably be tomorrow’s sewing project. It’s a fussy project because the wool is ravelly and shreddy and I will have to seal every raw edge prior to handling it. This is more prep work than I usually give to a project. But that’s okay — I have nothing to do tomorrow except knit and sew! Ah, bliss! Number 31 and 32, finished, and that means I met my goal for this year. 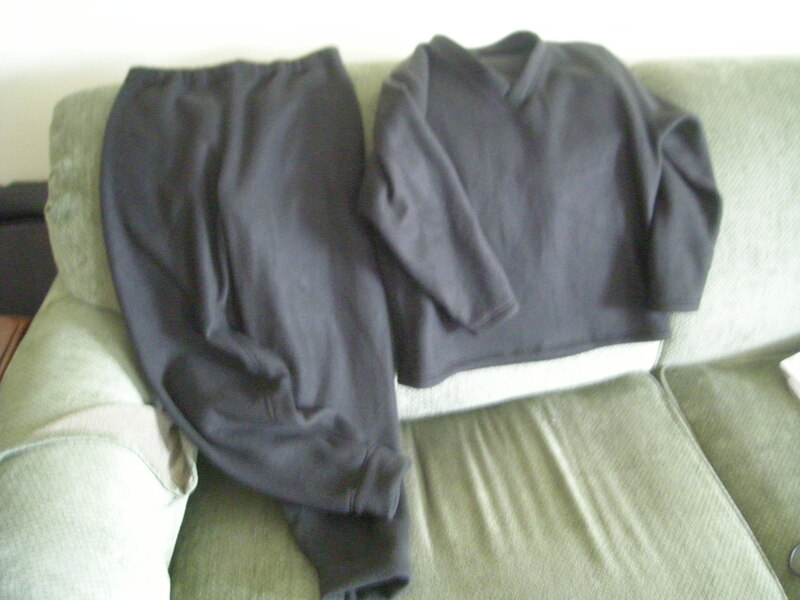 That’s a sweatshirt and track pants in fleece that is almost black but really more of a very dark charcoal. 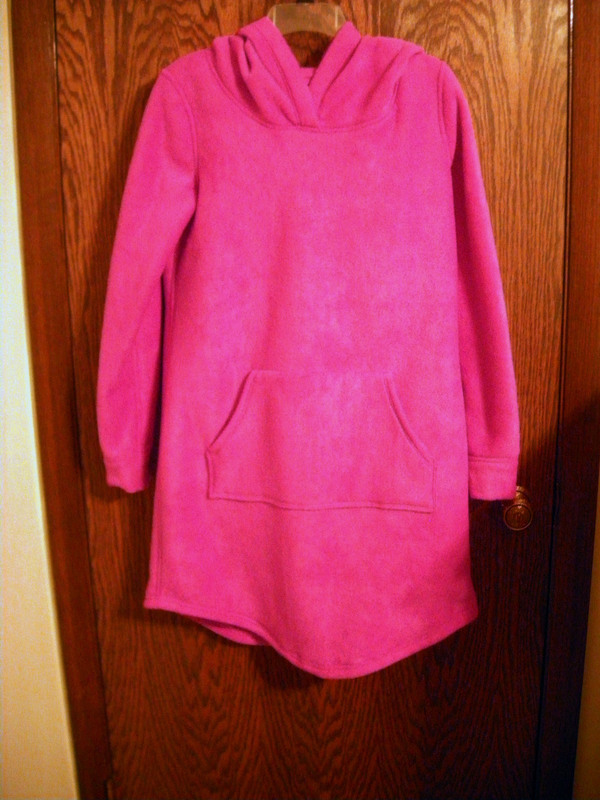 I have one more fleece outfit cut and in progress, and then I’ll be laying off the fleece for a while. I do have a couple more lengths in the stash, but they’re neons meant to make “Please don’t drive into me” bright zippies for running outdoors in the spring. They can wait. So, my goal was a garment a week for 32 weeks, totaling 32 garments, and here I am 16 days from the end of the year with the goal already met. And heading into the winter holidays, too, which I plan to use as a make-cation. I think I’m just going to tackle the stack of projects that are started but not complete — the Missoni dress that needs new sleeves, the wool skirt that’s cut and sitting in pieces in a project bag, etc. I don’t know if I can get it all done — there is, after all, the tiny matter of a big holiday with a complicated family looming on the calendar. But I can knock out most of the pending projects, if not all. Clear out the bulk of this mess so I can start the new year fresh. That will be a good feeling. 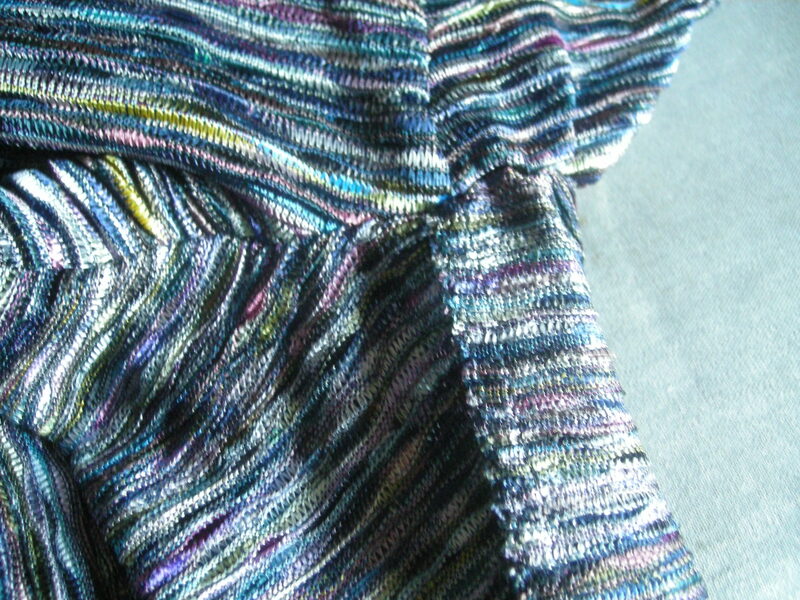 By the way, I made my knitting goal some time ago. I never posted this here, but my goal was six knitted garments, and I’ve completed eight, with four or five more in various stages of completion. I think I might try for twelve next year, because why not? 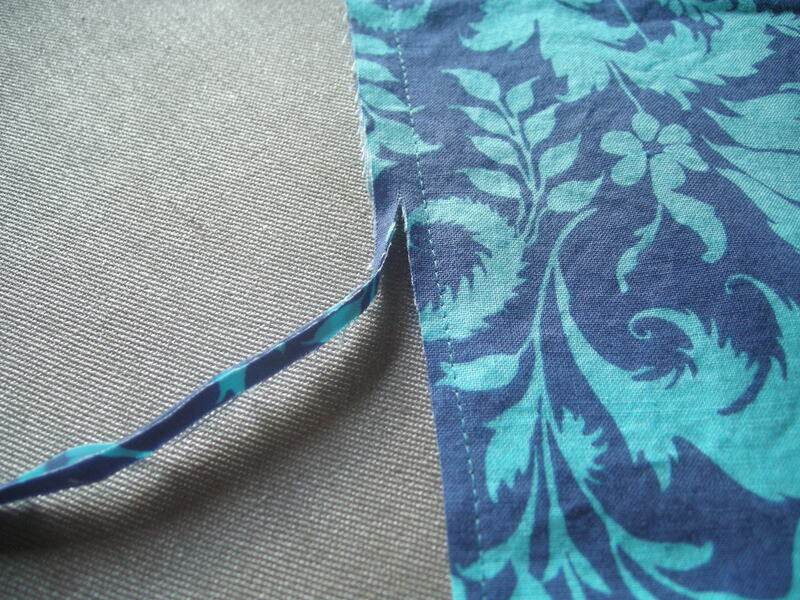 Soooo tempted to buy some fabric to celebrate making my goal. This outfit here is another 2.5 yards out, and that plus the four from last week’s red fleece set puts 6.5 yards into the “out” column since 12/1/14. 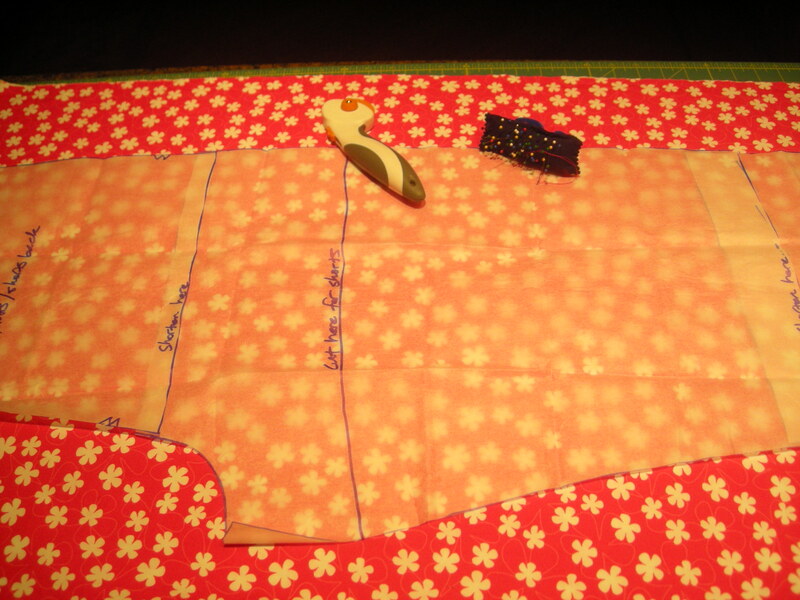 That’s not a bad start on the whole fabric stash adjustment process (two yards out for every yard in). But I think I might just bank that yardage for now because there’s a blouse pattern I’ve been eyeing that takes 4.25 yards — crazy yardage for a blouse, about double what you would expect for most blouses. I have some eggplant silk charmeuse in the stash that would work, but I see this as more of a crepe — more matte than shine — so I might just pop for some silk georgette or crepe de chine once I bank enough yardage to justify the splurge. Do you use the end of the year period to motivate you to finish tasks? I find it’s pretty useful. Track pants have been all over the runway this year. Many designers showed them in luxe fabrics, such as this textured chiffon pair from Gucci. Notice the banded cuff at the ankle, which is the detail I’m most interested in. 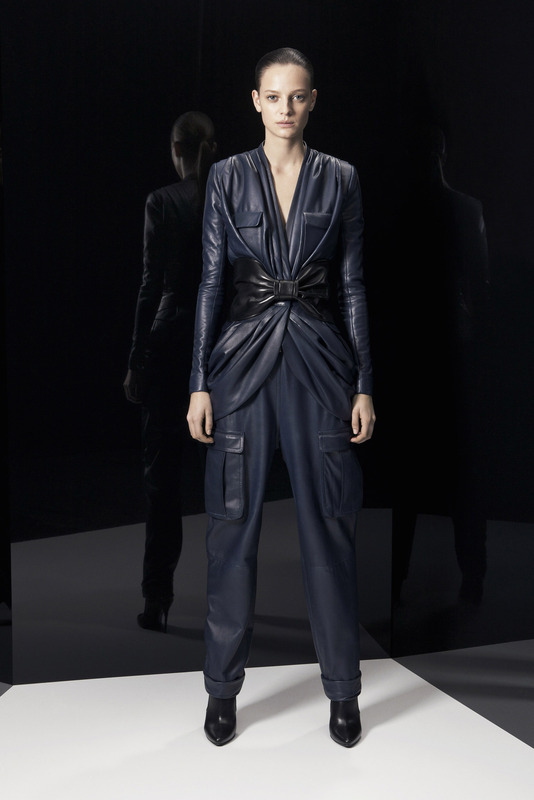 I was kind of knocked out by the leather version from Balmain. These are so rock and roll. And with cargo pockets? Yes, please. Derek Lam went the other direction, making them in a more familiar fleecy fabric. So, yeah. 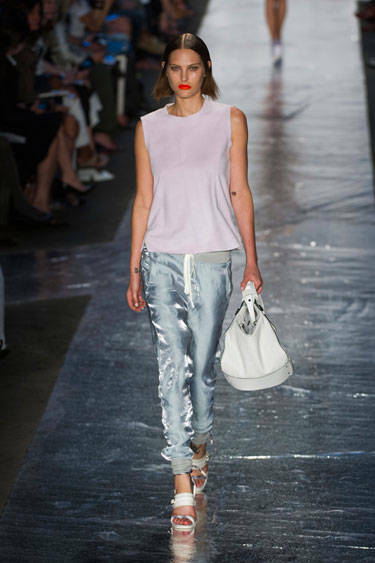 Track pants on the runway. My first impulse was to make a pair in a luxe fabric like a washed silk, and I might still do that, who knows. 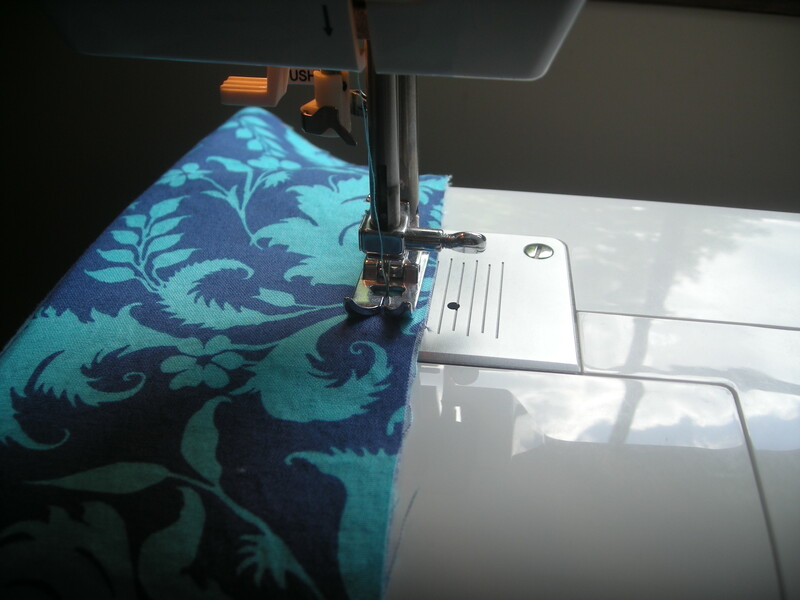 I have a pattern and anything is possible in my sewing room. 🙂 But given my interest in this detail from the runway, it’s probably not too shocking that I decided to make a pretty ordinary pair of fleece track pants with a banded cuff. 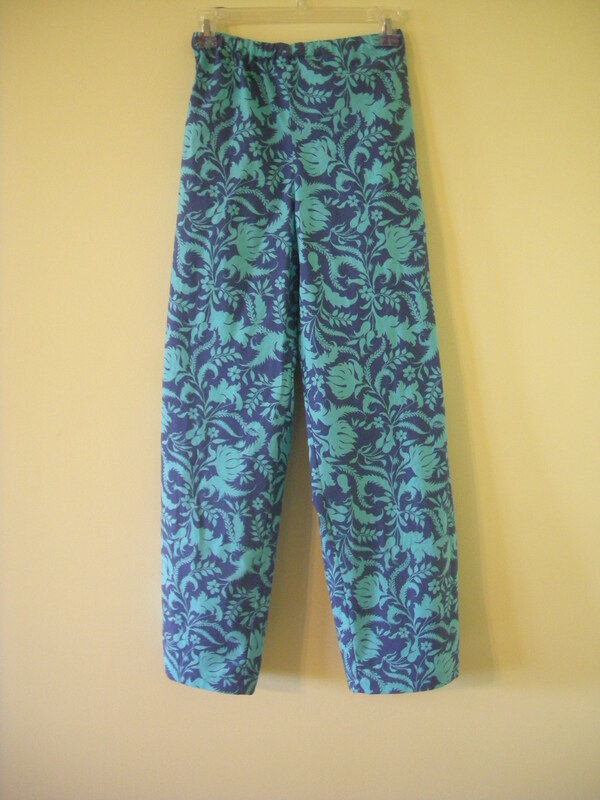 I started with this Green Pepper pattern (505 Polar Pants). This pattern was made for polar fleece, and I had some leftover from the gray Warm Thing, so this was my starting point. I didn’t have any suitable tricot or jersey for the pockets, so I skipped those. The pockets are made in welt fashion over the hip, with zipper closures, and I thought adding two more layers of fleece there would add bulk in a bad way. That’s not something I need. Ever. It’s worth mentioning that the pant legs are all in one piece. It’s not a front and a back, but a whole leg. There is an inside leg seam and a crotch seam, and that’s it. 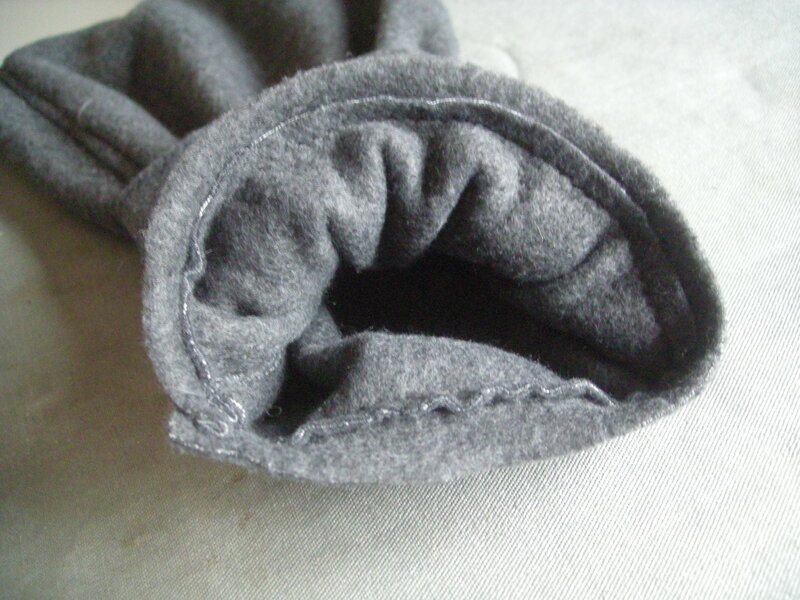 With a bulky, stubborn fabric like polar fleece, eliminating seams is a good idea. 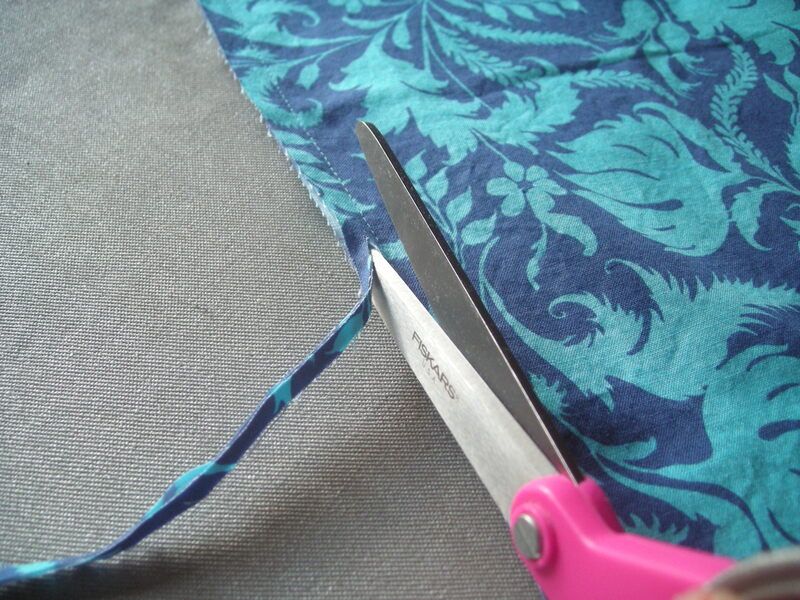 I wouldn’t want to do this with a lighter weight fabric, which would need the stability provided by the side seams. 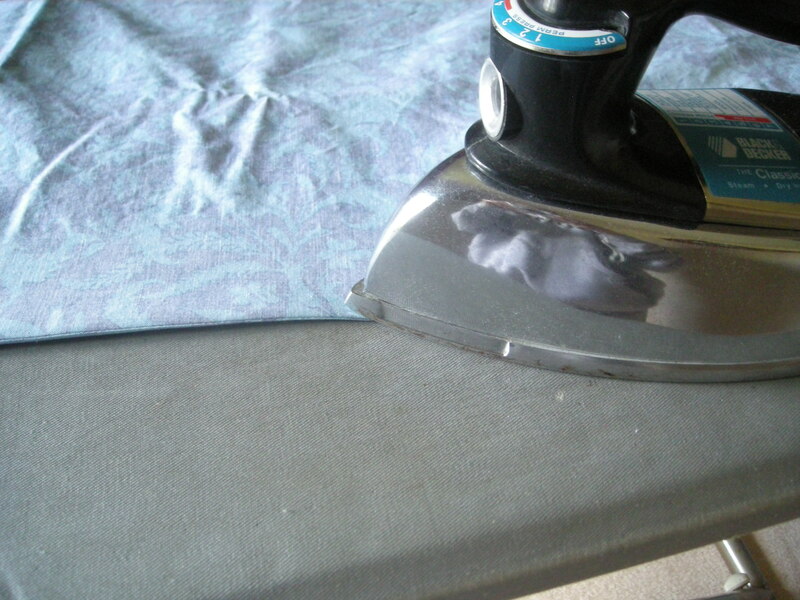 But for a bulky fabric, this works pretty well. This is a unisex pattern, and I’m always skeptical of those. Most unisex patterns are shaped more for men than women, and I am shaped more like a woman than a man. You know. Hips. Waist. No need to accommodate the twig and berries out front. It’s also a multi-size pattern, so I scaled from a small hip to an extra small waist. I shortened the crotch depth by about 3/4″ (a little under 2cm), and that gave me a more womanly fit. 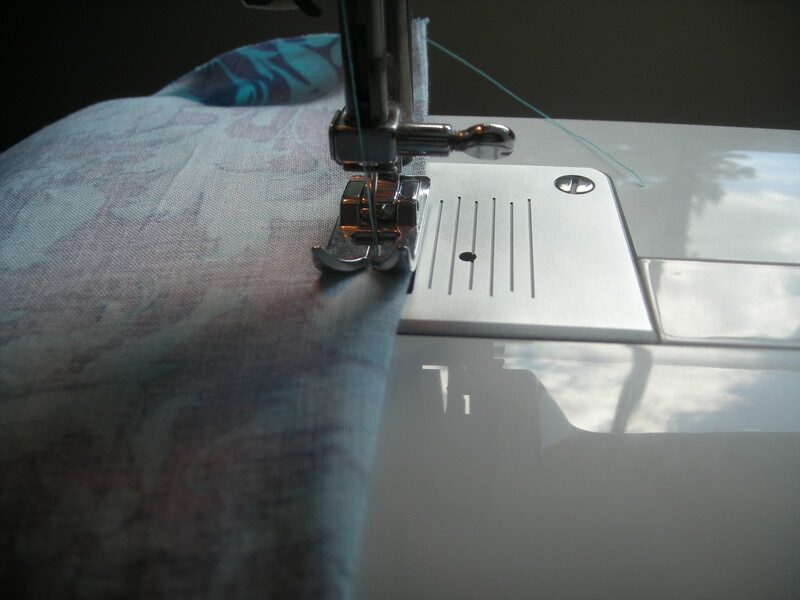 The pattern called for something like a 1.625″ (4cm-ish) hem. I eliminated that and removed enough length at the bottom to have the pants end about an inch or two above my ankle before adding the cuff. This isn’t rocket science. Approximate measures are fine — if you look at the pictures above, most of them are a little puffy above the banded cuff, so a bit of extra length there won’t hurt anything. I wanted my cuff to be about 2.5″ long when finished. 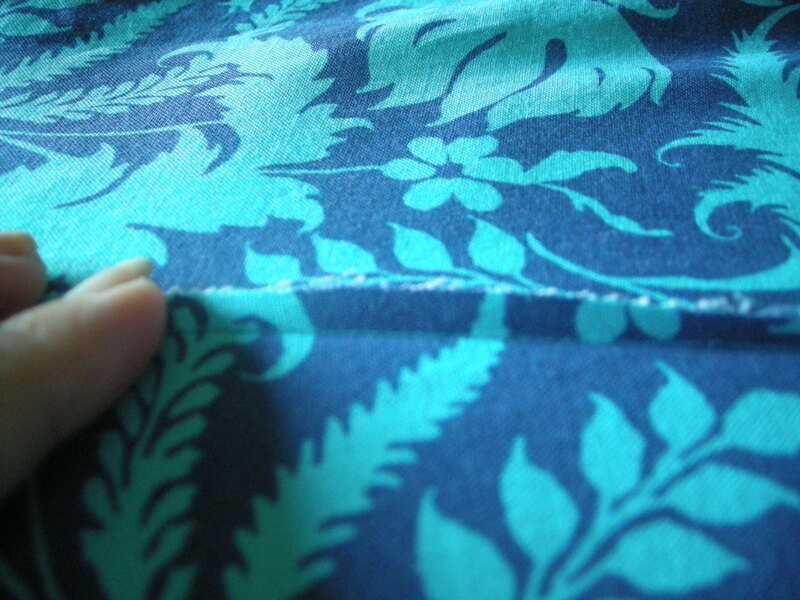 To figure out the size of the cuff piece, the first thing I did was measure the stretch in the fabric. 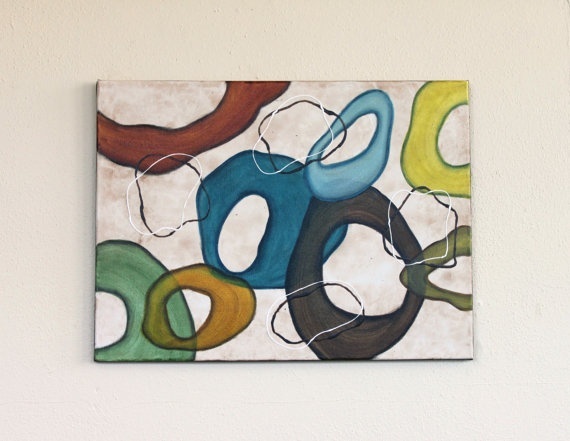 I had an 8″ scrap, and it stretched to just over 11″, so that’s in the neighborhood of 37% stretch. That’s a good amount of stretch, so I knew I could make the band a little tightish and it would still stretch to go over my ankle. Next, I measured my ankle at the widest part. That’s kind of a weird angled measure, so the easiest thing is to show you where to place the tape measure in case you ever need to measure this, too. Yes, I have white carpet in my sewing room, and yes, that’s a stupid place to have white carpet. In my defense, it came with the house and we just haven’t replaced it yet. I would never put white carpet in any room other than a shrine with a velvet rope across the door barring entry. But that’s me. Obviously, my house’s first owner had other ideas. Wait, what were we talking about? Oh, right, pants cuffs. So, my ankle is 12″ around the widest part, and I wanted a more or less 2.5″ cuff, so I cut the cuff piece like so. I love the gridded Pellon stuff for pattern drafting. Those lines are all 1″ apart, so I just cut a piece that was 11.5″ by 6.25″ and called it a cuff. With a half inch seam allowance at the side, this makes the circumference 10.5″, plenty big enough to fit over my 12″ ankle given the almost 40% stretch in the fabric. The pant legs themselves were several inches wider than that at the bottom, so I just stretched the cuff to match the pant leg as I sewed. This is the beauty of knits. You can ease as you go just by stretching the pieces to be the same size. 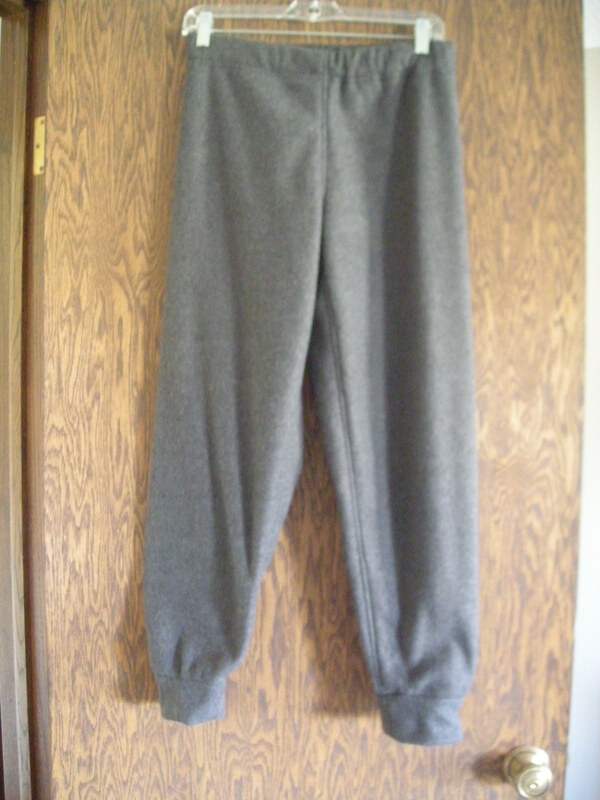 This meant that, after it was sewn, the pant leg piece had a bit of rippling in the seam allowance from the extra ease there. 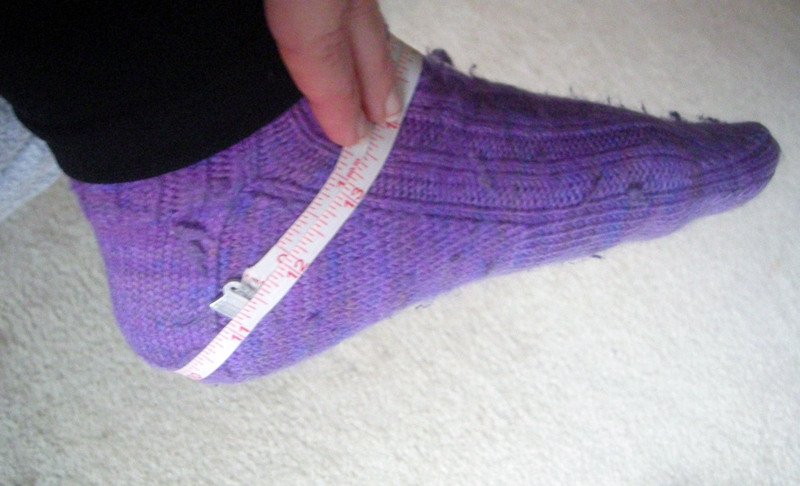 So I trimmed that seam allowance to eliminate the bulk, and this is what it looked like. That looks like the mouth of a sea creature that is about to do something very bad to a nearby swimmer! The next step was to turn up the cuff and stitch in the ditch on the right side to encase those raw edges inside the cuff piece. I should mention, I used a narrow zigzag for these seams because that lets the seam stretch as it goes over the ankle. Here’s the finished cuff. You can see that there is just a bit of ease in the pant leg above that stitching line. 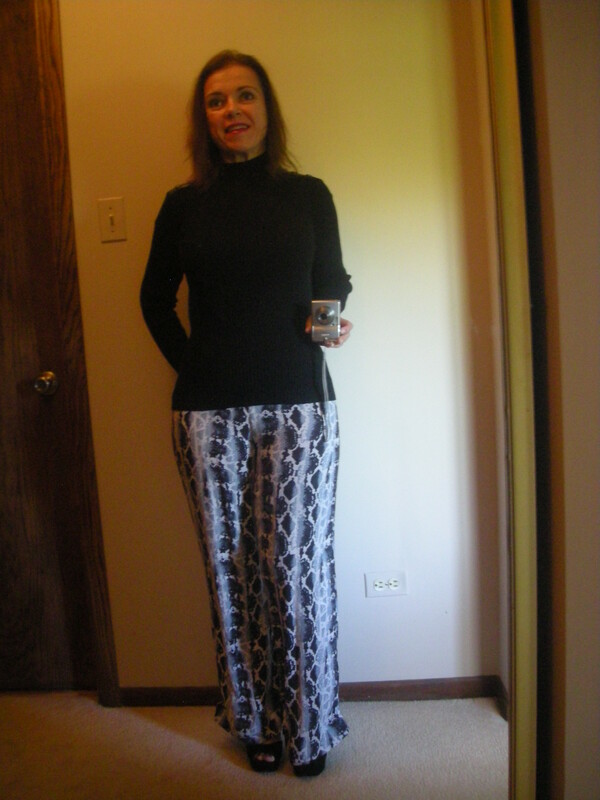 And here are the finished pants. I’m pretty happy with the way these turned out, and the fit through the waist and hip is good enough for this kind of garment. This strikes me as a strange low/high/low circular fashion moment — the uber casual track pant, converted to a runway garment, that inspires a pair of fleece pants to wear around the house. But these were easy enough that I might make some more from some other leftover fleece. Might as well. There’s almost no work involved now that I’ve drafted the cuff and worked out the fitting kinks. How do runway pieces inspire your creations? I keep a lookbook, a binder of pictures from magazines and fashion websites containing things I would like to make and wear. In fact, the criteria for my lookbook is exactly that: Would I make it? Would I wear it in real life? I might buy instead of making, but if it isn’t something I find interesting enough and pretty enough to make, it doesn’t go into the book. It’s got to be worth either the time (making) or the money (shopping) in order to qualify. My lookbook pictures have notes scribbled on them to remind me why I included them. 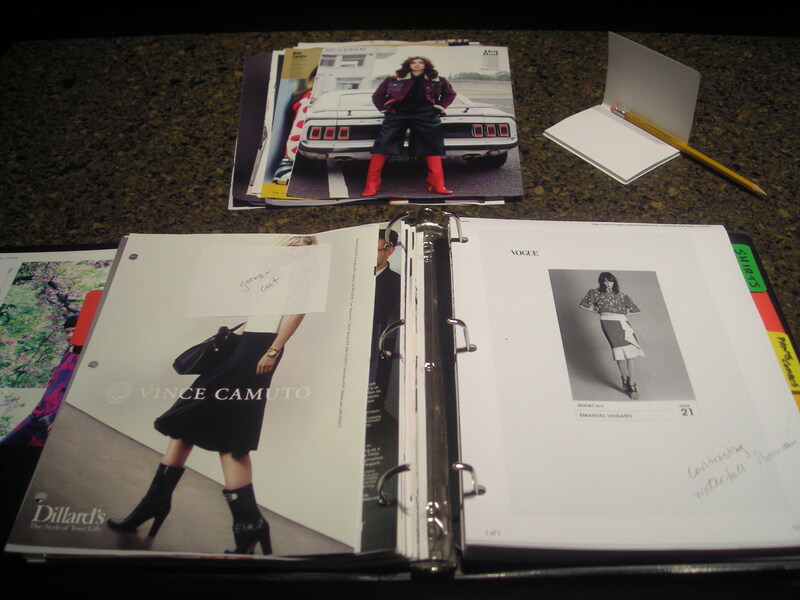 In the picture above, on the left page, the note mentions the placement of the gores on the Vince Camuto skirt. 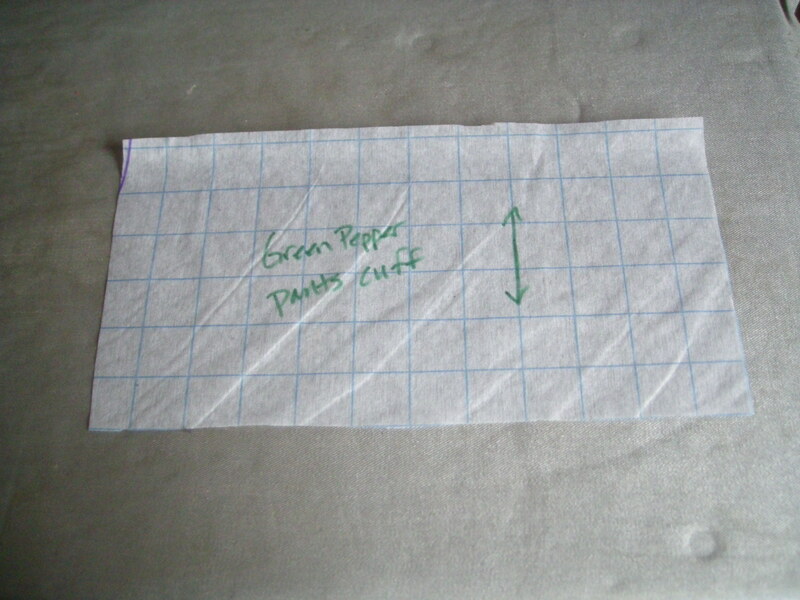 On the right page, the note is about the way the waistband, hem flounce, and waterfall flounce are colorblocked. The loose page above, awaiting notation and filing in the proper section of the binder, is going to include a note about the combination of red boots and purple jacket — not a combination I’ve worn before, but it works here because of the very casual nature of the clothing. Also, red boots. Want. I own almost no clothing that fits, after dropping from a 22 to a 6/8 rtw. I have a decent clothing budget, but I need so much that it cannot possibly be enough. While I was busy being sick and gaining and losing all that weight, the cut and styles of clothing changed enough that I can’t always judge how something will look on me just from eyeballing it. This inability to predict means I have to try on everything, all the time, and am frequently surprised by the results. I got used to dressing a heavy body, and the clothing is dramatically different in plus sizes than in regular sizes. What worked in a 22 absolutely does not work in a 6/8. 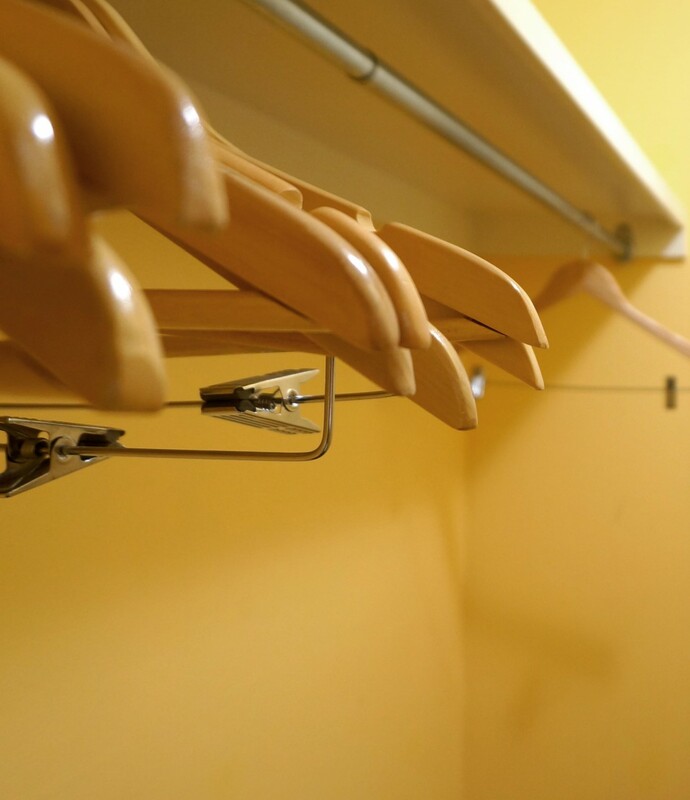 That last point is the real tipping point that turns the fun of shopping for a new wardrobe into a confusing and sometimes frustrating experience. I blogged about this before with the blue mullet skirt. This skirt is a shrunken-down clone of a red skirt I wore the crap out of when I was a 22. It looked great on me then. Looks sort of shapeless and lumpy on me now. That skirt taught me an important lesson: all my dressing preferences for the heavy body are done and over with. I can’t rely on any ideas I used when dressing in a 22. One of the weird things about plus-sized clothing is that it doesn’t rely on style lines the same way regular sizes can. The majority of shirts, for example, are all cut basically the same way — no waist, boxy body shaping, deep armholes, floating hems — to accommodate the needs of a larger body. Instead of creating a sense of style through style lines, these garments rely on things like color, pattern, and maybe a bit of embellishment. This is why so many things in the plus size department are bedazzled, sequined, beaded, or look rather like a muumuu. When you can’t manipulate style lines, these are the details left to manipulate. Which brings me to whimsy. I’ve never been a native fan of whimsy as a style mode, though I can certainly appreciate it on other people. But it’s just not something that ever felt like it was generated from my personal preferences, more like something I fell into because plus-size dressing is limited in options. I bought a few whimsical pieces because they were available, and they were at least interesting, which is more than can be said for a lot of plus wear. Add into that the fact that I have a friend who is so deep into whimsy as a style mode that she sort of pushes it on everyone without probably even realizing she does it. I’ve been fabric shopping with her a couple of times, and I always ended up buying whimsical prints while under her influence. This is not to say it’s her fault — it’s not. 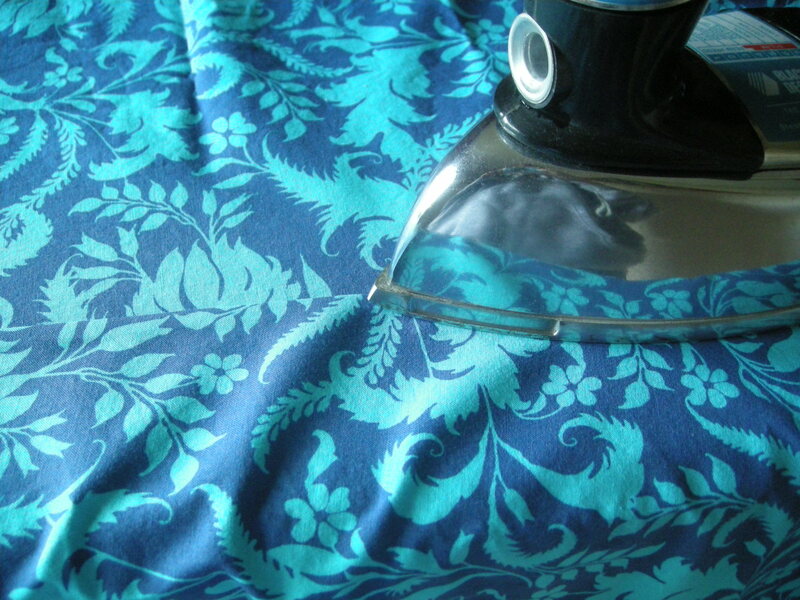 It’s more like one of the factors that led to me buying fabric such as this. That would be a hot pink quilting cotton printed with white daisies. I no longer remember which quilt shop supplied it, but I know I was shopping with my whimsical friend at the time because those are the only fabric stores she will visit. I have zero interest in quilting and would never shop in those places otherwise, even though they’re stuffed with inventive, fun prints. 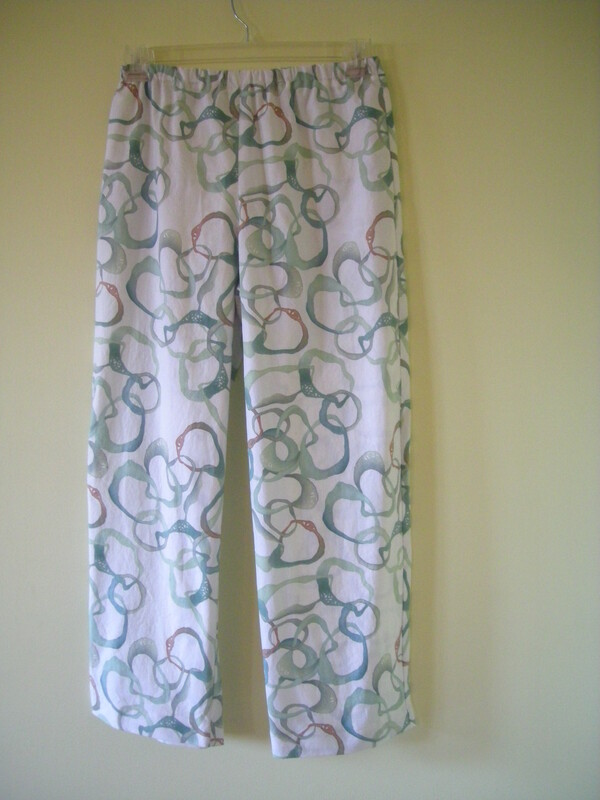 But because we went shopping together a few times, I have a couple of other quilting cottons with similarly whimsical prints, two of which have already been made into pajama pants (here and here), and two which are casual summer skirts (here and here). Of those finished garments, the black and white floral Ungaro-inspired flounced skirt is the one that is most native to my natural style in a normal size. The pajama pants — well, it’s fine to get a little crazy with a print there and use something you might not wear out of the house. That’s why the pink daisy stuff, which I’d originally thought would make a fun casual summer skirt or shirt, will now be another pair of pajama pants. Whimsy might have felt adventurous when I was a 22 rtw, but now it just feels out of step with my style. While I was at it, prepping and cutting this fabric, I pulled out all the other whimsical prints I’d picked up when plus-sized and shopping with my whimsical friend. One of those prints will be a fourth and final pair of pajama pants — really, four is enough — and some will be made into project bags. The rest went into the donation pile. Letting go of those prints feels a bit like letting go of my make-do mentality, familiar to many people uncomfortable in their bodies. You don’t shop for pleasure or for a sense that you can make yourself look good. You shop out of necessity, and the only goal is to find something that doesn’t look straight-up horrid. Lack of revulsion was the same as approval when approval was out of reach. 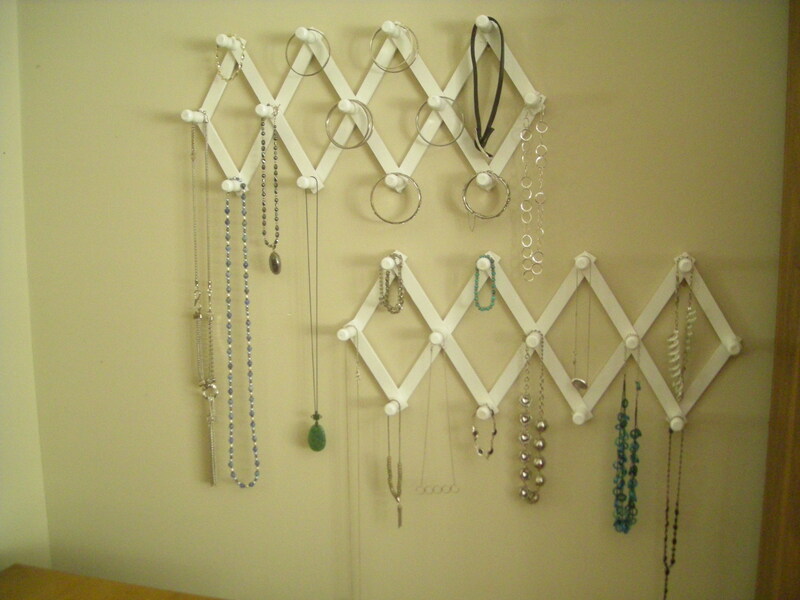 Now when I shop, I am rediscovering the idea that I can pick and choose among several options. I don’t have to buy something just because it fits and isn’t revolting. I can find things I like, that fit well and look great, and reject all the other “almost but not quite” pieces. This is liberating, and the lookbook helps a lot with controlling that process. By focusing on the things I like, and the reasons I like them, I’m a more discerning shopper when I hit the stores. It’s not just about identifying trends. It’s about identifying a style that will work for me on this body. How has your style evolved over time? What made it evolve?